Five men were arrested in Ohio, accused of plotting to blow up the Route 82 Brecksville-Northfield High Level Bridge near Cleveland. Charges are now pending against Douglas L. Wright, 26, Brandon L. Baxter, 20, and Anthony Hayne, 35, Connor C. Stevens, 20, and Joshua S. Stafford, 23. NBC's Brian Williams reports. Federal agents have arrested five people who were plotting to blow up a bridge near Cleveland, Ohio, an incident not connected to the anniversary of former al-Qaida chief Osama bin Laden's death, officials say. Douglas L. Wright, 26, Brandon L. Baxter, 20, and Anthony Hayne, 35, were arrested by members of the FBI's Joint Terrorism Task Force on April 30 on charges of conspiracy and attempted use of explosive materials to damage physical property affecting interstate commerce. Also arrested were Connor C. Stevens, 20, and Joshua S. Stafford, 23. Charges are pending against them. The five were "controlled by an undercover FBI employee," and agents had them under extensive surveillance for a long period of time. The explosives they allegedly purchased were inoperable. "There was never any danger," one federal official said. On what appeared to be the Facebook pages of Hayne, Stafford and Baxter, there were claims that they were affiliated with Occupy Cleveland, which moved swiftly Tuesday to distance itself from the bridge plot. Occupy Cleveland canceled May Day protest plans to march in the city and hang signs after “we awoke to the news of the arrests,” coordinator Johnny Peskar, 22, told msnbc.com. “We don’t need any implications in this nonsense,” Peskar said. Occupy organizers had seen a few in the plot hanging around earlier events, but their actions were “autonomous,” he said. Court documents say the FBI became aware of the men in October. A confidential source told the FBI that they were acting suspiciously at a protest event, wearing masks, talking on radios, and saying they didn't believe in peaceful protest. They carried flags associated with anarchist groups. From that point on, the informant was in constant touch with the group members. Their goal, one of them said, was to destroy private property "to send a message to corporations." Last November, they discussed setting off smoke grenades on Veterans Memorial Bridge in Cleveland as a diversion while they would be knocking bank signs off the tops of tall buildings downtown. Federal officials say Wright, Baxter and Hayne describe themselves as anarchists who considered a series of evolving plots over several months. As Stevens and Stafford came into the plot, they started talking about using explosives. The informant brought in two people he said could help them get explosives. These people were actually FBI undercover agents. The group members agreed to buy tear gas and gas masks. Two weeks later, they said they wanted to buy plastic explosives. 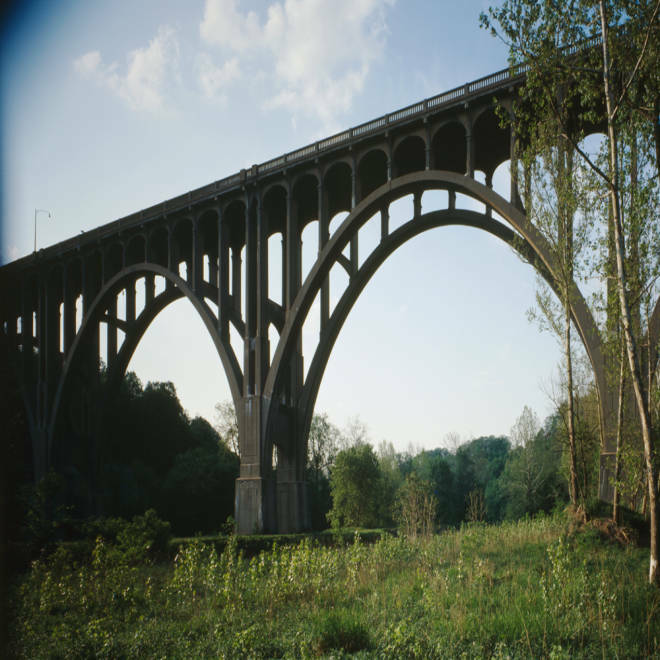 A photo of the Brecksville-Northfield High Level Bridge taken in 1995 as part of the Historic American Buildings Survey and Historic American Engineering Record projects for the U.S. National Parks Service. In late April, they settled on trying to blow up the Route 82 Brecksville-Northfield High Level Bridge. This bridge crosses from Brecksville, Ohio to Sagamore Hills, Ohio over the Cuyahoga Valley National Park. On April 29, they met with the undercover agents and bought what they thought were two homemade bombs for $450. They planned to place them on April 30 but were arrested by the FBI. The members of this group had a strong desire to commit acts of violence but no idea how to do it. At one point, a member of the group says what they needed was "mainly bleach," because, he said, that's what land mines and hand grenades were made with during World War II. "The complaint in this case alleges that the defendants took specific and defined actions to further a terrorist plot," said U.S. Attorney for the Northern District of Ohio Steven Dettelbach. "The defendants stand charged based not upon any words or beliefs they might espouse, but based upon their own plans and actions." This story is developing. Please check back for more details.